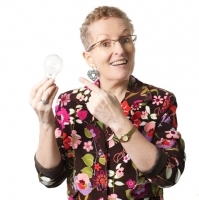 My blog, Spotlight on Marketing, is the place for us to share thoughts, opinions, questions and answers about marketing (especially marketing with integrity, from the heart). "We have finished reading your revised version. Thank you. It is now clearly a much improved version from the previous draft. Your speed and efficiency are truly amazing." Also: "Great, thanks for the Kay Ross magical touch. You never cease to amaze us with your speed and efficiency (and of course your talent!)" I'm Kay Ross, a Hong Kong-based marketing consultant & coach, editor and copywriter, and I'll help you get money-in-the-bank results with your marketing. Check out my CV, Courses, Portfolio, Testimonials, Articles, Resources, Podcasts and FAQ pages. Are you still unconvinced about the value of twitter? Or have you created a twitter account, and you need help with crafting a compelling twitter bio and effective tweets? How will it work? I'll charge a monthly fee (minimum three-month package) based on the number of tweets you want me to write/edit per week and the number of brainstorming sessions you want per month. If you're in Hong Kong, I'll meet with you face-to-face. If not, we'll communicate by phone and email. Note: I won't manage your twitter account for you 24/7 and I don't want to know your password - YOU have to be the one in charge, posting tweets and monitoring and responding to what people are saying to/about you. It's about authenticity. Or here's another option, if you're in Hong Kong: an introductory two-hour "Twitter Tutorial" session, in which I'll sit beside you (and up to two other people from your organisation), in front of your computer, to show you how to get started on Twitter, what to do, what NOT to do, and WHY Twitter is a fabulous tool for your business, if you use it right. HK$2,000 for one person, HK$3,000 for two people at the same time; HK$4,000 for three people at the same time. craft a juicy "elevator speech"
If that's what you're looking for, I invite you to contact me today. Words are powerful. They've started - and ended - wars and love affairs. The RIGHT words in your marketing messages, aimed at the RIGHT people, will help you to "sell more stuff" and make more money (whether your "stuff" is a product, a service or an idea). So I approach all of my writing and editing work from a marketing point of view. I won't write or edit a single word for you until I understand you, your organisation, your brand, your products and services, your target market and the purpose of every document. In fact, I'll definitely have lots of questions for you - check out my article, "So You Want To Commission A Freelance Writer/Editor?". By the way, that means I'm not interested in a last-minute, one-off, "can-you-check-our-brochure-because-it's-just-about-to-go-to-print?" transaction. And while I'm working on writing/editing your marketing material, I'll probably also offer you some strong opinions and recommendations about all the other elements of your marketing. If that sounds good to you, please contact me today. I'm also delighted to be a guest speaker at conferences, seminars and workshops for professional bodies, Chambers of Commerce, universities and non-profit community organisations. My performing skills definitely come in handy with my training and public speaking work. In fact, a student in one of my marketing courses wrote: "I thought the course was exactly as I anticipated. The teacher was highly proficient. 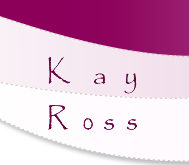 Kay Ross is a natural communicator." 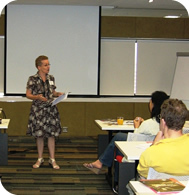 In particular, I teach workshops that give participants a fun, hands-on experience of the principles, skills and mindset that improvisation performers use - the results, for individuals, teams and organisations, include better leadership, teamwork, communication, creativity and nimble responsiveness to change. If that sounds like something you want or need, contact me today. First, please browse the rest of my website (especially my Meet Kay, CV, Courses, Portfolio, Testimonials, Articles, Resources, Podcasts and FAQ pages) to get to know me and my skills, background and values. Then, contact me today to arrange an initial, no-obligation discussion. If we agree to move ahead, I guarantee that you'll get money-in-the-bank results with your marketing. P.S. If you'd like a free copy of my "Sell the Sizzle" article, full of practical tips about how to write compelling marketing communications material, please go to the opt-in box in the top right-hand corner of this page. You'll also automatically receive my free monthly marketing e-newsletter.